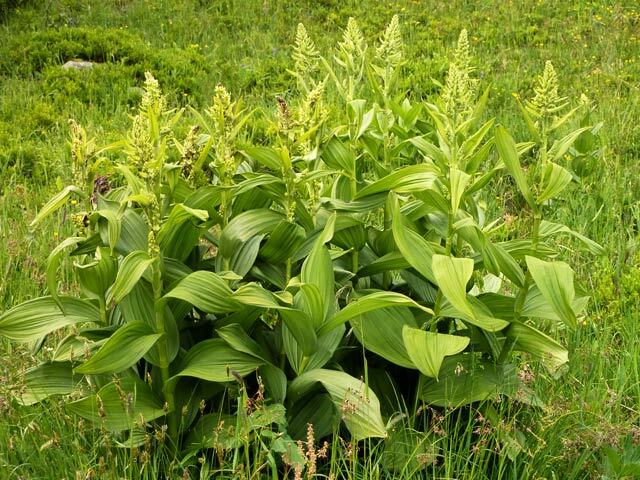 Veratrum is a genus of about 27 species in the Melanthiaceae (part of the polyphyletic former familiy Liliaceae, the so-called 'petaloid monocots'). 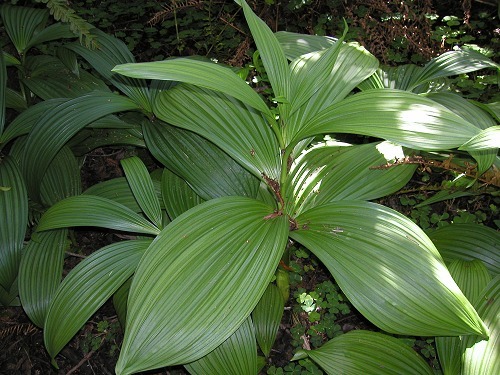 This fascinating family boasts several horticulturally desirable genera in addition to Veratrum, perhaps most notably Paris and Trillium, but also Stenanthium, Toxicoscordion (formerly Zigadenus) and Xerophyllum. Veratrum is distributed throughout the temperate northern hemisphere and just crosses the Tropic of Cancer in Thailand and Taiwan. Its center of diversity is in east Asia, where a recent study suggests the genus originated. 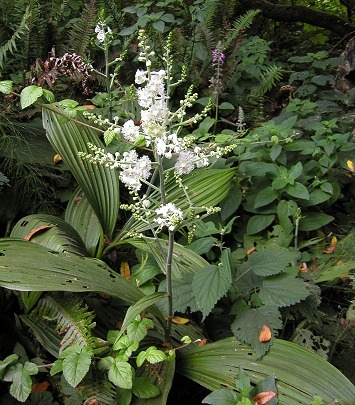 The genus divides naturally into two Sections, Veratrum, typified by V. album, and Fuscoveratrum, typified by V. nigrum. 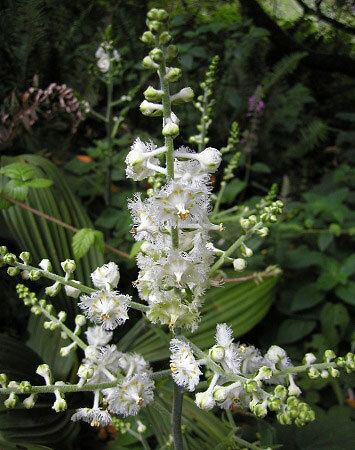 Flora of North America still considers the small North American genus Melanthium to be distinct but two recent molecular phylogenetic studies have shown clearly that the four species in this group fall within Veratrum Section Fuscoveratrum. The Plant List is still accepting the genus Melanthium. For the moment we will include these four species in both places. While some species are likely to be of interest only to serious students of the genus, many have great merit as garden plants. 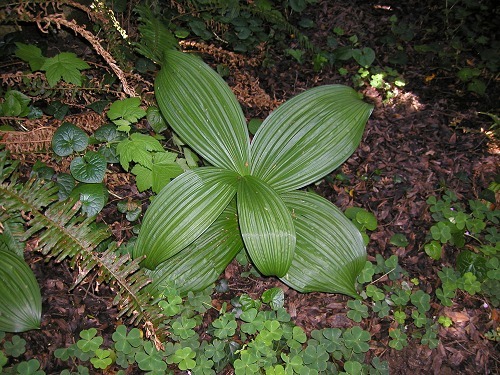 William Robinson wrote in 1883 that "The leaves are handsome, and most effective when the plant is in small groups, either in the rougher parts of the pleasure ground or by wood walks, thriving in peaty soil." One wonders to what bacchanalian activities these clumps bore silent witness in the "rougher parts of the pleasure ground". Gertrude Jekyll described V. nigrum as a "fine middle European plant of noble foliage…which is in perfection in April" and used large clumps of it to provide structure in her famous long, spring borders. 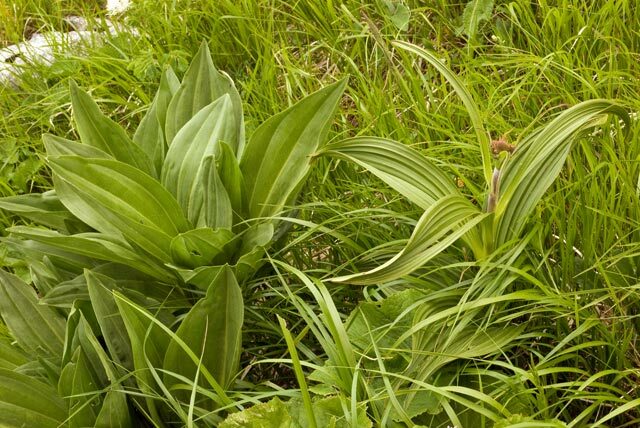 More recently, Christopher Lloyd summed up the opinion of Veratrum aficionados when he wrote, "A colony of any well-grown Veratrum species, has me standing agape before it." 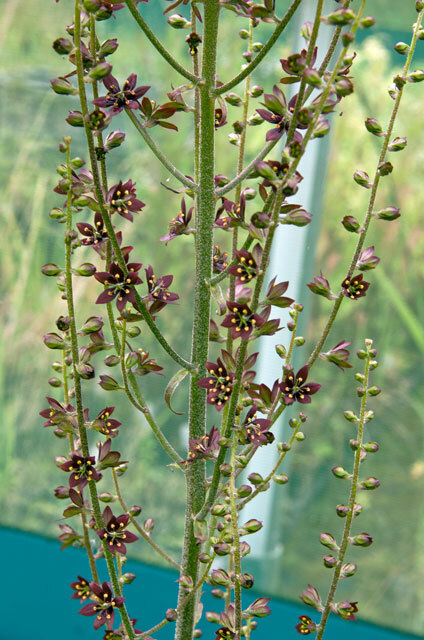 The reason Veratrum have not become more popular is neither because they are unattractive or difficult but because they are slow, painfully slow. A recent Swiss study estimated that it can take 40 years (sic) for V. album to reach sexual maturity in the wild. This can be reduced to as few as ten years in ideal conditions in cultivation. The smaller members of Section Fuscoveratrum, notably V. formosanum are much quicker, often flowering in their third year from seed. 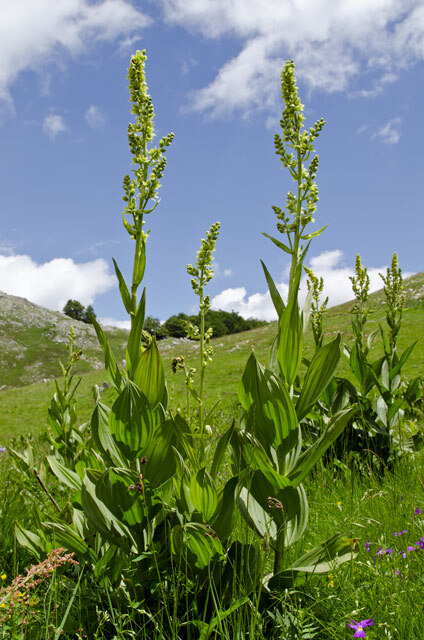 All Veratrum species have a more-or-less reduced rhizome, with fleshy contractile roots that pull the crown of the plant down to considerable depths as it ages. The plants are deciduous and growth recommences each spring from a bud at the apex of the rhizome. Once commenced, growth is rapid and dormancy starts just as suddenly after fruiting. 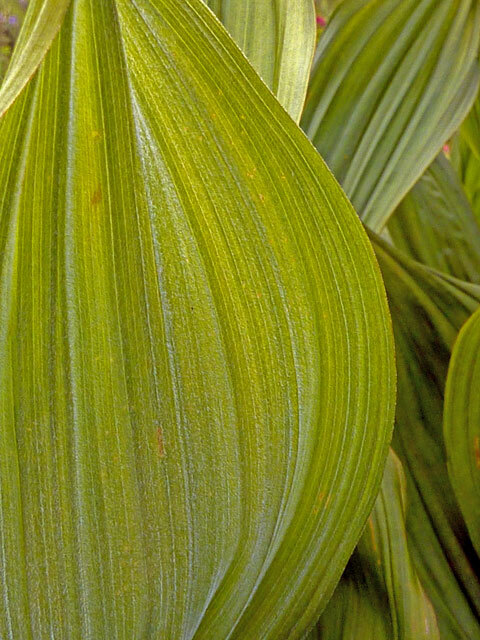 Most Veratrum species require moist soil throughout the growing season, especially if you want them to set seed. The species vary greatly in hardiness but, with a small risk of failure in a really cold winter, all species except the Californian endemics V. fimbriatum and V. insolitum are hardy down to zone 7 or 8. 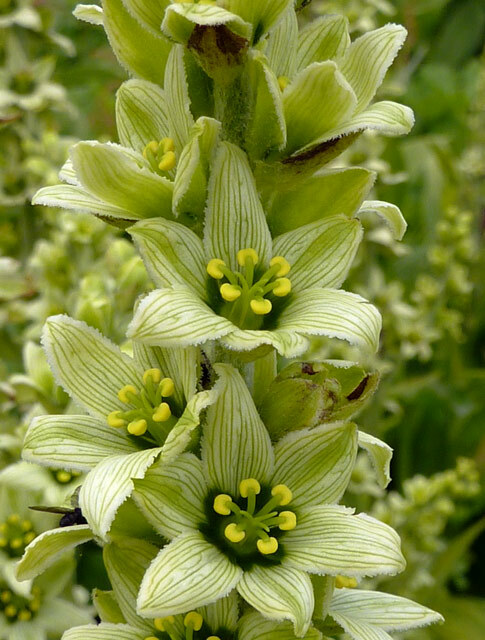 There is a Veratrum for every situation in the garden. The sensational pleated foliage of the larger species is one of the highlights of spring. A well-grown plant knocks the stripes off any Hosta. You could plant them in part shade with other woodlanders, for example hellebores, Hepatica, Epimedium and snowdrops, perhaps complemented by later emerging deciduous ferns, Rodgersia and Actaea. 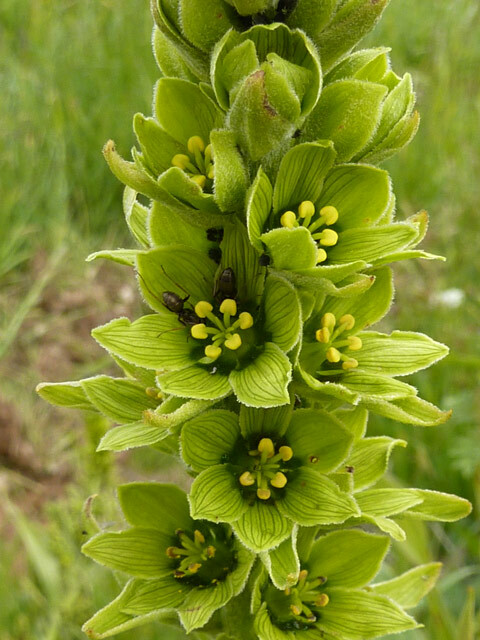 Woodland Aconitum species and late-flowering Clematis might take over in autumn as the Veratrum begin to go over. Alternatively you could try them beside a pond or stream or in a bog garden. In this situation in the wild they are often associated with Trollius, various Polygonum species and terrestrial orchids. 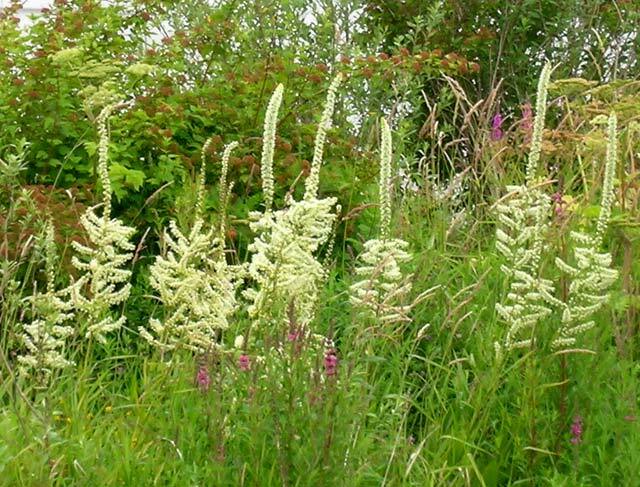 To this list you could add Astilbe, Iris ensata cultivars and another favourite plant, the unusual North American/East Asian disjunct genus Trautvetteria. 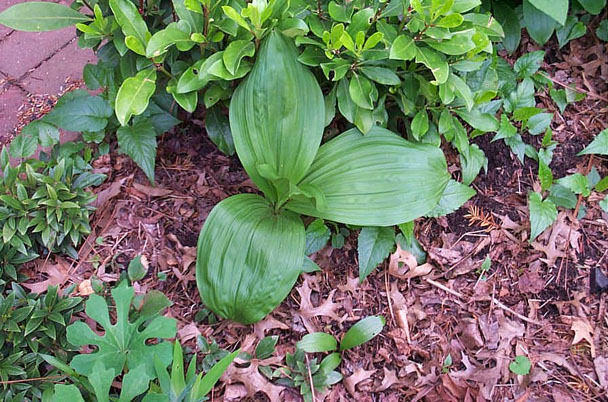 Other than the easy V. nigrum, species in Section Fuscoveratrum deserve the luxury of a well-drained but moist raised bed, where they could be associated with other choice plants such as Paris, Trillium, and unusual species of Polygonatum, Disporum and Disporopsis. Finally, Christopher Lloyd suggested that one of the most effective ways of displaying Veratrum is as a specimen in a lawn. Why not? They contain numerous alkaloids, some of which are extremely toxic to mammals, often having been responsible for deaths or foetal deformities in livestock. One fortuitous medical discovery has resulted from the fact that the alkaloid cyclopamine, so-named because pregant ewes that had grazed on its leaves gave birth to lambs with a single cyclops eye. It turns out that the alkaloid alters the expression of a famous gene, Sonic Hedgehog, which is widely involved in correct development of foetuses. Normally this gene is switched off when development is complete but it is reactivated in certain cancer cells. Cyclopamine has shown promise in the treatment of certain otherwise intractable brain, breast and pancreatic cancers. What better reason could you want to grow a plant in your back yard? 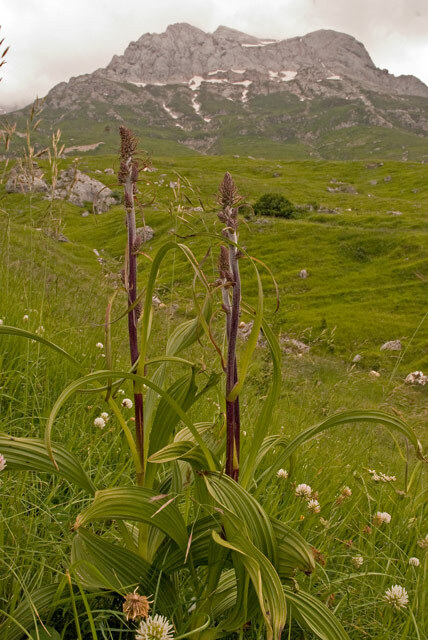 Veratrum album L. has an almost circumpolar distribution, occurring from the Pyrenees in western Europe, through all the major mountain ranges of Europe into the Caucasus and across Siberia to Alaska. It also occurs as far south as Japan. Unsurprisingly for such a widespread species it is extraordinarily variable and many of the taxa that have been named are likely simply samples of the variation to be found in the wild. 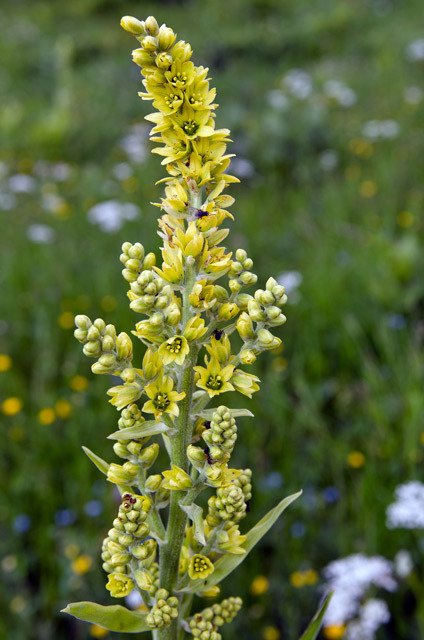 In nature, V. album is typically found in subalpine meadows which are vernally wet but at lower altitudes it sometimes occurs as a plant of woodland margins. In cultivation it is perfectly happy in ordinary soil but it needs plenty of moisture during the growing season to flower well. The images below were taken by Tom Mitchell in various parts of Europe, illustrating some of the variation. 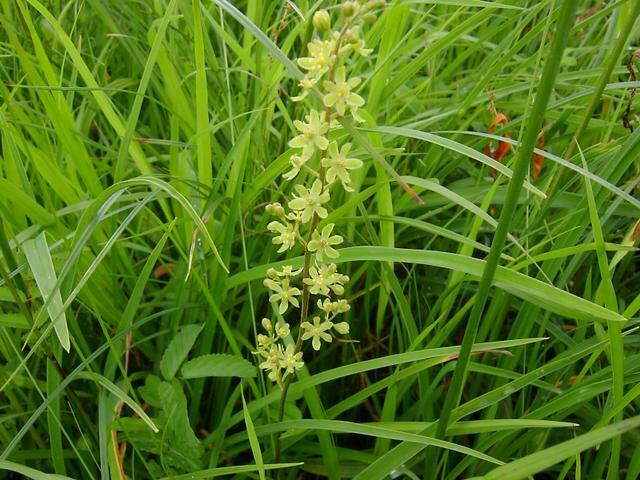 Rather few populations of this species have white flowers, the Latin epithet notwithstanding. Note the ant in the sixth image. 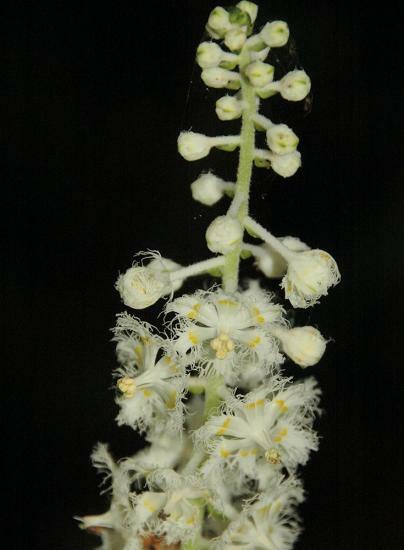 Veratrum inflorescences in the wild are often crawling with ants, which appear to be feeding on nectar secreted from the prominent glands at the base of each tepal. Whether the ants return the favour by defending the plant against predation is not known. 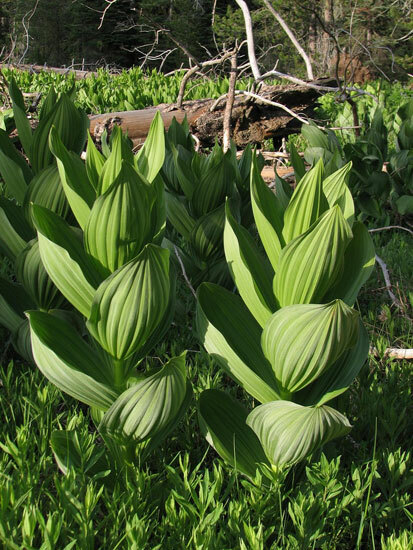 Veratrum californicum Durand is a species that has a wide distribution in the Western US at elevations between 0-11000 ft (0-3300 m). Plants grow 3-6 ft (1-2 m) tall, flowering mid to late summer. 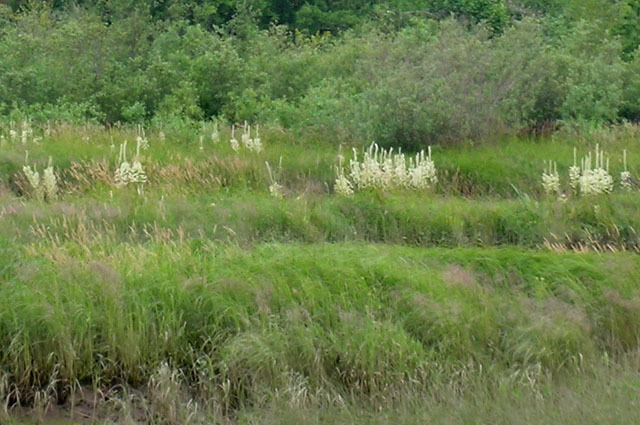 Photos 1-2 were taken by Kathleen Sayce of plants growing on marshy shelves in the freshwater tidal areas of the Columbia upriver from Astoria, Oregon. Photo 3 was taken by Richard Haard. Photos 4-6 were taken by Nhu Nguyen in Yosemite National Park, CA. These photos show the beautiful architecture of the leaves, which are not as delicate as they seem. 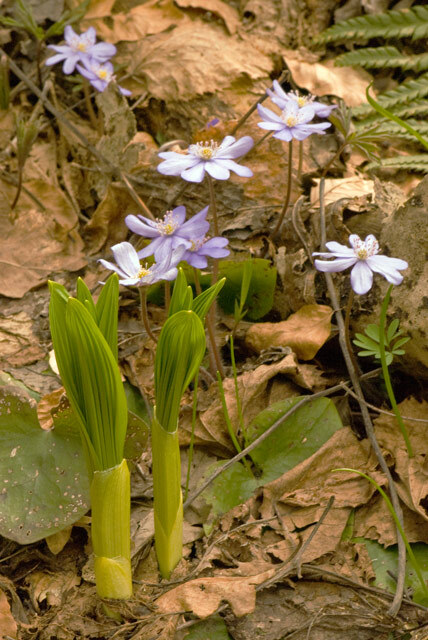 Photos below taken in Lakes Basin Recreation Area in Plumas County, California by Mary Sue Ittner show new leaves in spring. 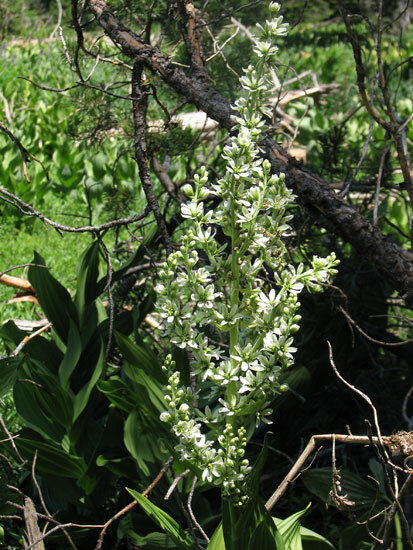 Veratrum fimbriatum A. 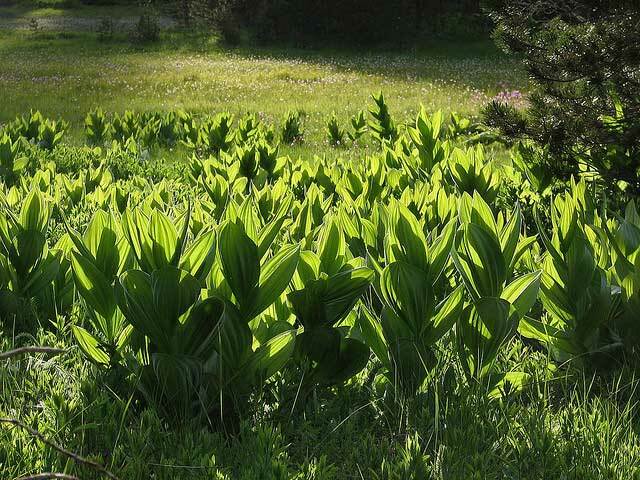 Gray known as the Fringed Corn Lily, is rare and restricted to shaded wet places on the Mendocino Sonoma Coast. 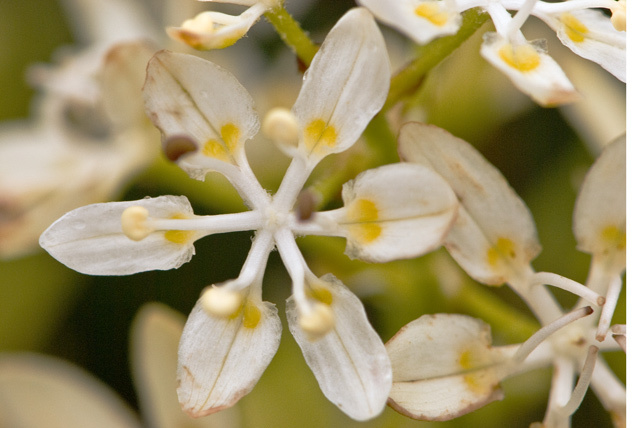 It has white flowers with a yellow base and the petals are fringed. Leaves are large and pleated, emerging in spring, when they make a statement. By the time the plants blooms late summer, the leaves can be a bit weathered. The first two pictures taken late April 2004 show the leaves after they have emerged and still look very attractive. In the first picture you can see the habitat companions: Oxalis oregana, Asarum caudatum and Polystichum munitum. The second shows a grouping of plants. The last two pictures below were taken August 2003 and show the flowers. 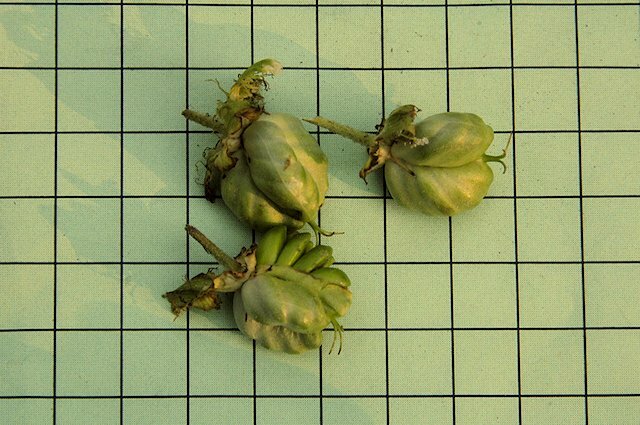 Photos below from Bob Rutemoeller including the last one of the fruit on a 1 cm grid. Photos below were taken by Mary Sue Ittner showing the new leaves in spring. 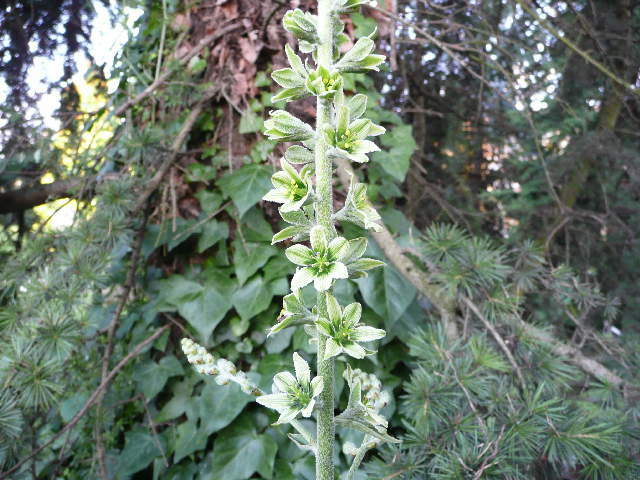 Veratrum lobelianum Bernh., considered Veratrum album ssp. lobelianum by some floras is a Eurasian species with greenish flowers. The first two photos were taken by Alessandro Marinello.The third photo was taken by Tom Mitchell on Krvavec Mountain in central Slovenia in late May. This is the first Veratrum to flower in cultivation in my collection. The yellow flowers in the background are Trollius europaeus. 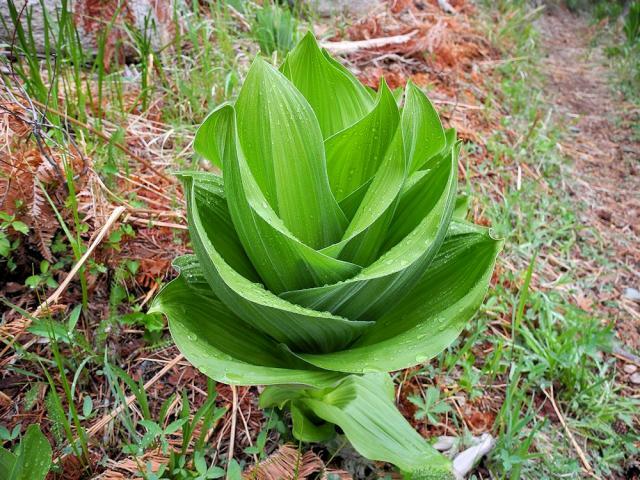 Veratrum maackii Regel is found in forest and grassland montane in Japan, Korea and China. The Japanese name is Aoyagi-sou or grass Aoyagi. Height 0.5 to 1.0 m. Photograph taken in Japan by Mari Kitama. 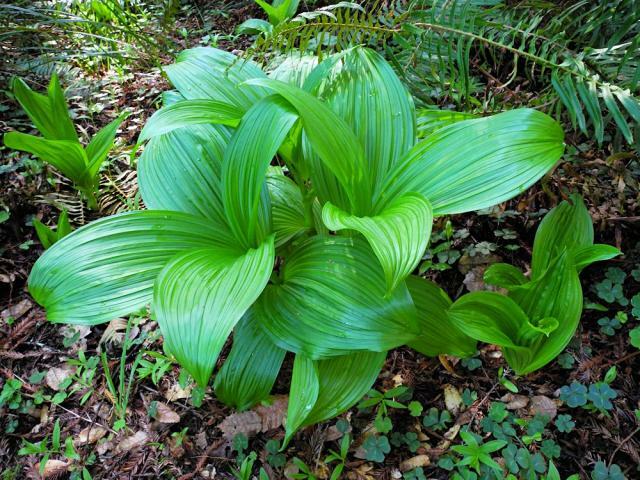 Veratrum nigrum L. is perhaps the finest of all Veratrum species for its sensational pleated foliage, which knocks the stripes off any Hosta when it emerges with the suddenness of a toadstool in spring. Gertrude Jekyll grew large clumps of it in her famous long borders and cut the flower spikes out as they emerged - sacrilege. 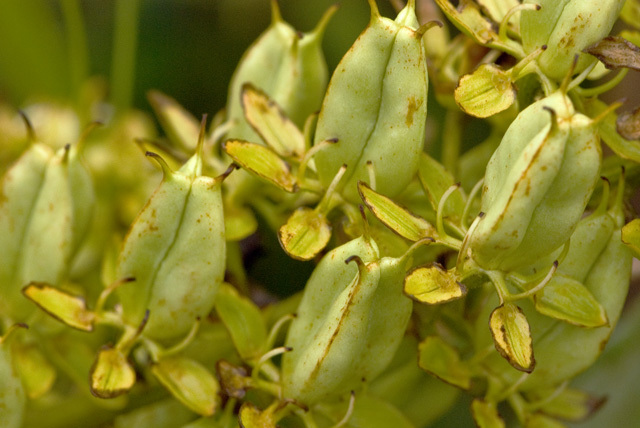 V. nigrum is distributed almost as widely as V. album, through much of southern and central Europe into central Asia and China as far east as the Pacific Ocean. It is very variable in size and in the shape and branching of the inflorescence. Some of the most exciting forms have immensely long bracts subtending the side branches of the inflorescence. The first photo below was taken in the Montgomery County, Maryland, USA, zone 7 garden of Jim McKenney. 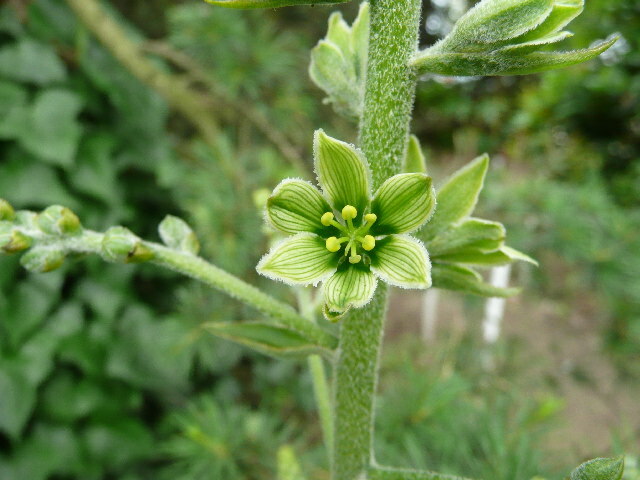 This is a young plant which has not yet bloomed - yet its foliage is already attracting attention. The subsequent images were taken by Tom Mitchell in various parts of Europe. 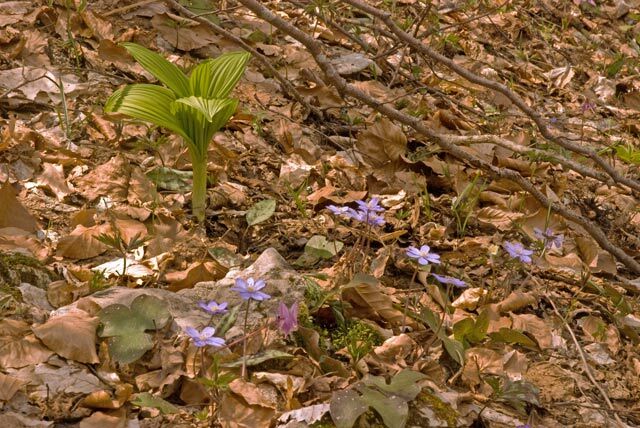 The first two shots are of V. nigrum emerging in a Montenegran woodland in May, with Hepatica nobilis and Erythronium dens-canis. 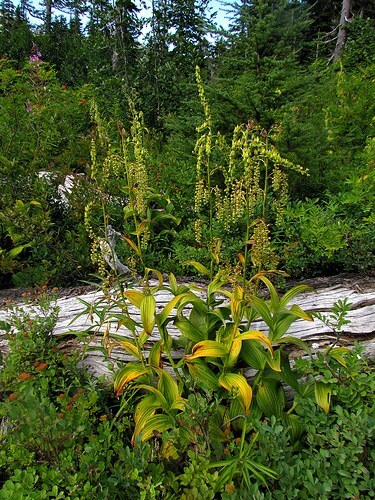 The next picture shows V. nigrum growing side-by-side with Gentiana lutea, with which it is often said to be confused, occasionally with fatal results (the Veratrum contains deadly alkaloids, whereas the gentian is an ingredient in bitter spirits). 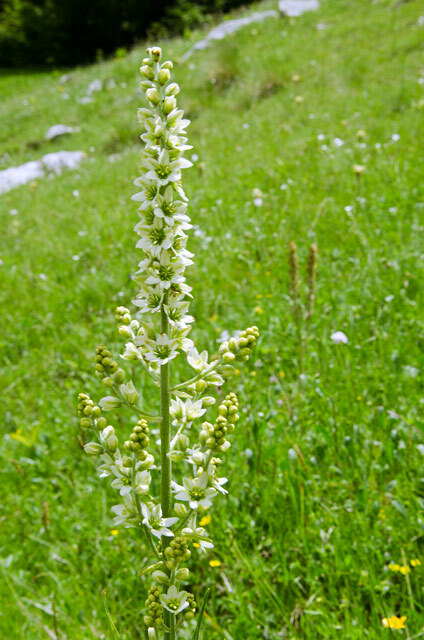 The last two photos were taken in Abruzzo, Italy in June, just as a huge population was coming into flower. 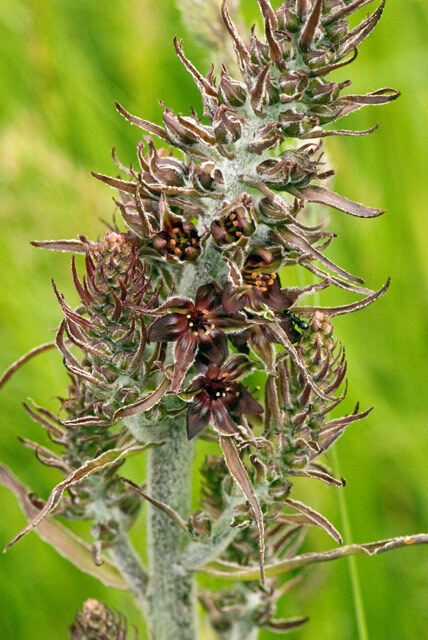 Some had bizarre inflorescences, with bracts like the whiskers on a cat. Veratrum parviflorum Michx. , syn. 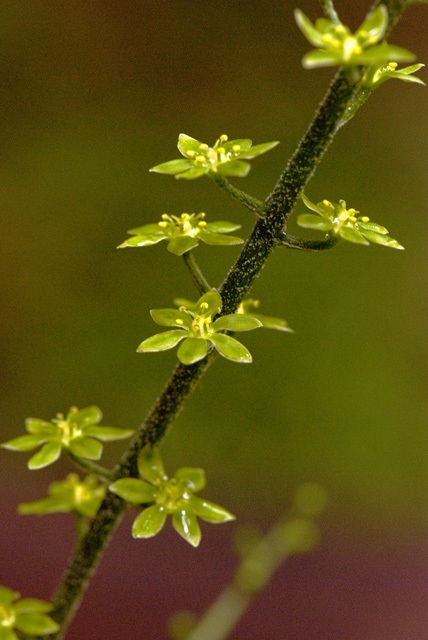 Melanthium parviflorum (Michaux) S. Watson, occurs throughout the Appalachian Mountains, where it is quite common. It occurs on or near mountain crests. 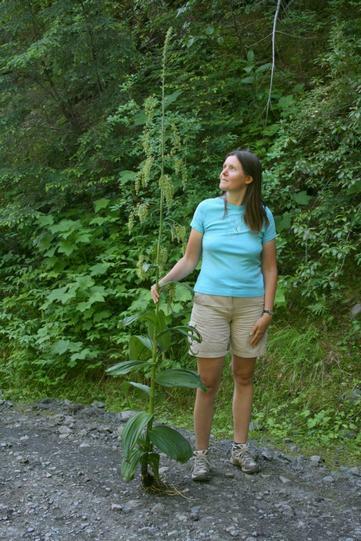 The plant grows to about 1.25 m tall, with a loosely branched inflorescence with few, small flowers. 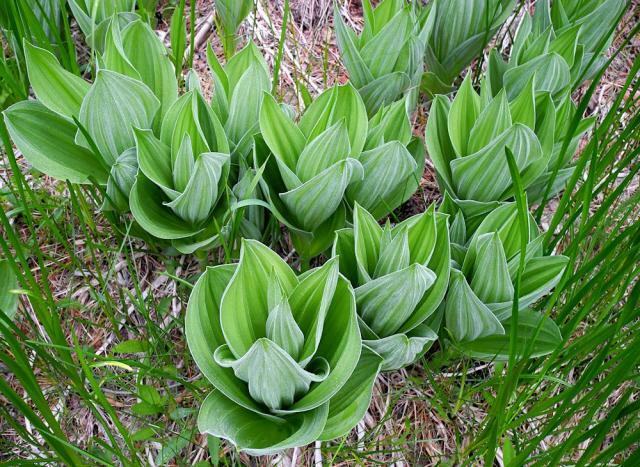 These are a bright emerald green, quite unlike any other flower color found in Veratrum. These images were taken on the Blue Ridge Parkway in West Virginia by Tom Mitchell. Veratrum virginicum (L.) W.T.Aiton , syn. Melanthium virginicum Linnaeus, occurs in wet prairies across much of eastern North America at low elevations. It must once have been abundant. Where I saw it, in Illinois, it is now confined by the corn desert to swampy road intersections and the un-farmed land alongside abandoned railroads. Horticulturally it is a very desirable species, which ought to be cultivated much more frequently. Unlike many Veratrum species, it flowers most years if well fed. 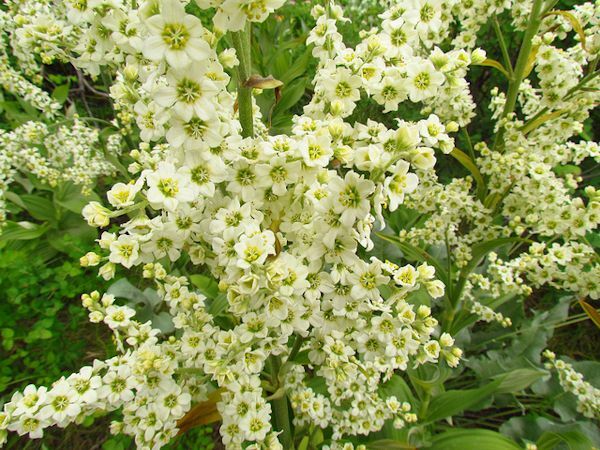 The flowers that make up the large, paniculate inflorescence change in color as they age from white, through greenish to yellow. 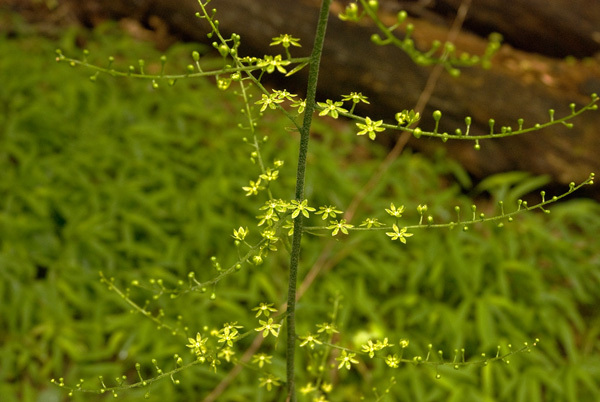 The filaments are persistent (see second image) and the seed capsules are the most decorative in the genus. These images were taken by Tom Mitchell in south western Illinois in mid July. The farmer on whose land we were taking pictures stopped to chat and was fascinated to discover that this madman had come all the way from England to look at his weeds. 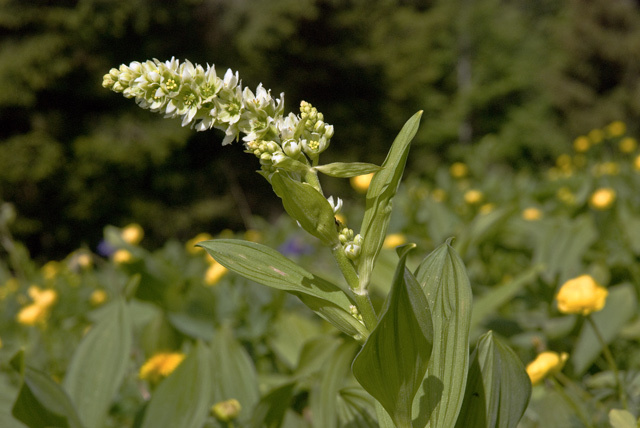 Veratrum viride Aiton is found in low, wet woods, seeps, bogs and wet meadows in North America. 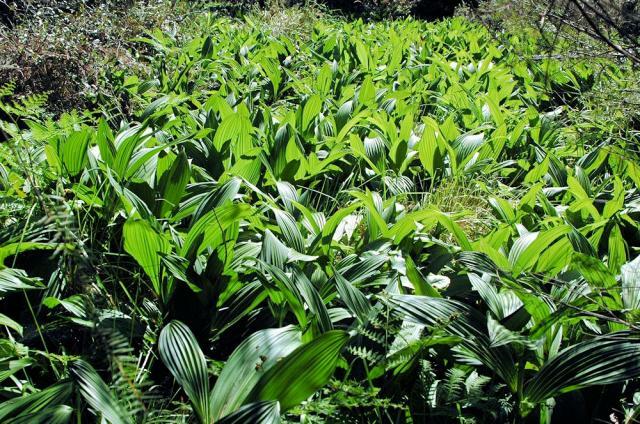 Growing from 30 cm to 2 m, it has greenish white to lime green flowers and pleated oval large leaves that overlap on stout stalks. Plants grow from stout crowns with persistent thick, fleshy roots and may be difficult to move and divide. Fresh seed should be sown as soon as it is ripe outside. All parts of this plant are poisonous if ingested. The first photograph by Roland de Boer, taken at Idaho Peak, British Columbia, Canada. The second photo from Richard Haard. Veratrum woodii J.W.Robbins ex Alph.Wood, syn. Melanthium woodii (Robbins ex Alph. Wood) Bodkin, is essentially a plant of the Ozark Mountains but there are disjunct populations in the Appalachians as far south as Georgia. 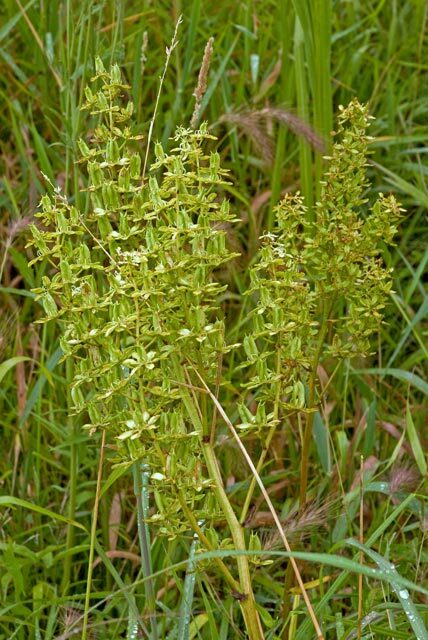 It is rather rare and, where it occurs, the populations are typically small, rarely flower and set seed even less frequently. Norlyn Bodkin spent four years studying Melanthium for his PhD in the 1950s and never saw it in flower. The first image below was taken in a patch of undisturbed woodland on a steep slope beside a small river in SW Illinois. 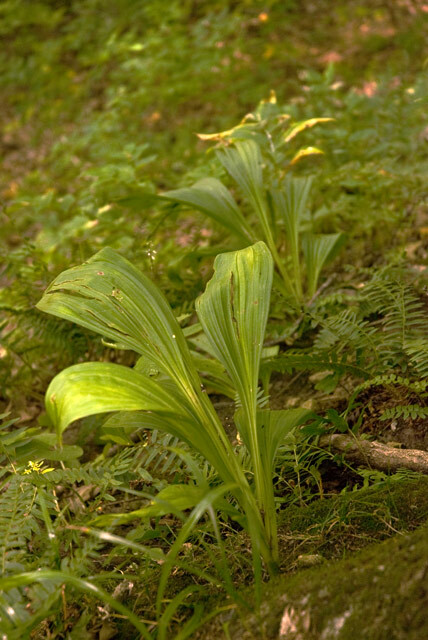 Note the characteristic manner in which the foliage 'leans' in one direction. 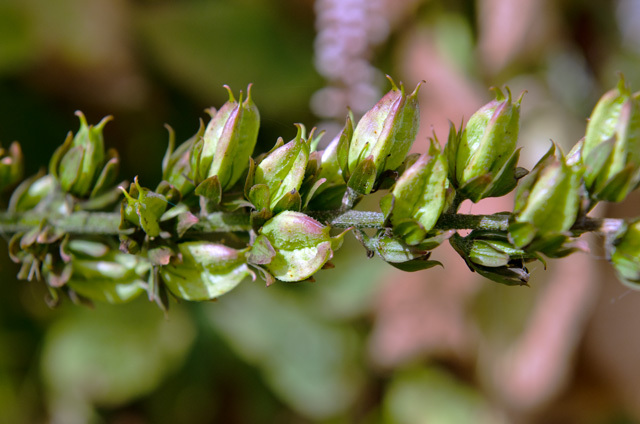 The second picture shows a plant flowering in late July in cultivation in the UK and the third shows developing seed capsules on the same plant in late August. All pictures by Tom Mitchell.